Paheli, one of the offbeat films in Indian Cinema, celebrated its 10th anniversary this June 24. Directed by Amol Palekar, and starring Shah Rukh Khan and Rani Mukherjee in the lead, Paheli is a cinematic epic adapted from a short story by author Vijayadhan Detha. The movie is a visually appealing portrait of Rajasthan and its desert, folk culture, ethnic fashion as well as traditions. Each frame of the movie brought the colors of Rajasthan alive on the silver screen through the emotive story of a newly married bride under the veil and her defiance to the restrictive norms in the patriarchal society. Indian Eagle takes a look into what makes Paheli an inspiration for travel to Rajasthan and what makes it a favorite of Indian Americans even after 10 years. In the history of Indian Cinema, Paheli is one of the few Hindi movies shot across the vast expanse of sands in Rajasthan. It provides a mirror to the beauty of rural India in general and holds a prism to reflect the hues of Rajasthan in particular. Paheli is a visual illustration of “Beauty is only skin deep,” one of the Shakespearean maxims, which is much true about Rajasthan. Both the throat-chocking aridity and the colorful beauty of this Indian state are so intricately blended in the cinematic frames that the gleaming beauty of golden sands in bright sunshine is apparently invisible to pairs of ordinary eyes. 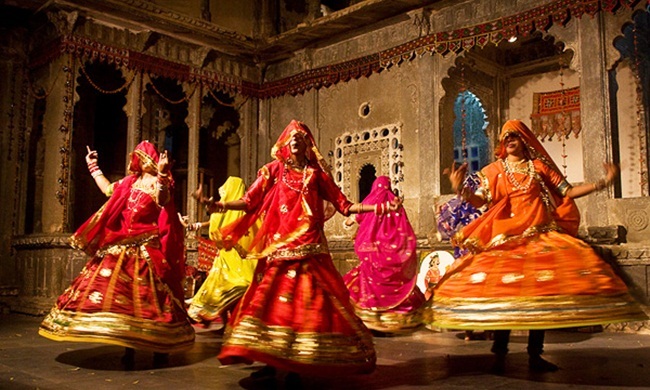 Paheli is an ode to the folk culture – music and dance – of Rajasthan. The song “Laaga Re Jal Laaga” featuring traditionally clad Rani Mukherjee and other rural belles perform Ghoomar, a most popular folk dance, on the stairs of a baori (stepwell) is one of the iconic sequences in Indian Cinema. Ghoomar is equally popular with the women of aristocratic families and the Kalbeliya women of the Gypsy tribe in Rajasthan. The premier of Paheli at some of the renowned international film festivals brought this Indian folk dance to limelight the world over. 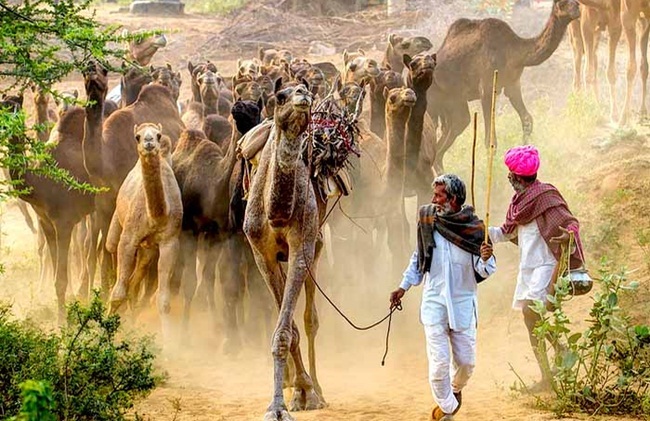 Among the most popular mediums of entertainment in the country life of Rajasthan, camel race and puppet dance find their place in the script of Paheli. Unique to the folk culture of Rajasthan, camel race and puppet dance are interwoven into the social life of the natives. These two are among the most popular tourist attractions of Udaipur, Jaisalmer, Bikaner, Mewar and Jodhpur. Paheli was the first Indian film to showcase the ethnic fashion of Rajasthan in true colors on the big screen. It was followed by the period drama Jodhaa Akbar showing the traditional Rajput fashion, in 2008. As the story of Paheli revolves around a rich merchant’s family in the upper strata of society, the characters of the leading cast are seen in the best of traditional attires, more refined and distinguished, which is a far cry from what the rural people of Rajasthan wear in day-to-day life. Rani Mukherjee’s character Lachchi is a newly married damsel with an embroidered veil over the head and wearing heavily embellished ghagra. Adding to the ethnic style quotient of the movie is the colorful turban that Shah Rukh Khan’s mustached character keeps wearing as the native male folks do. Even superstar Amitabh Bachchan flaunts a crimson red turban during his cameo in Paheli. Indian Eagle, a most trusted travel partner of Indian Americans and Americans, books cheap flights to Rajasthan with major international airlines. That was very post. These photos shows the culture and beauty of rajasthan. Thanks for the post. Because it shows culture of rajasthan.